Due to a screw up in the posting of items to the Hole, I lost this article – permanently. Perhaps I need to use some other software to generate the posts, one that allows me better control over the source material files. Anyway, I am re-posting Part 1 here. Fortunately, I saved my paper notes. Also, I am not going to retype the whole post, but just the gist of it. Anyway, you’ll get the idea. 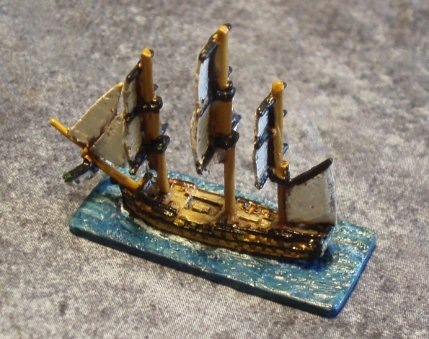 As I mentioned elsewhere I decided to paint some Napoleonic Naval vessels as the next little project there at Thomo’s Hole. 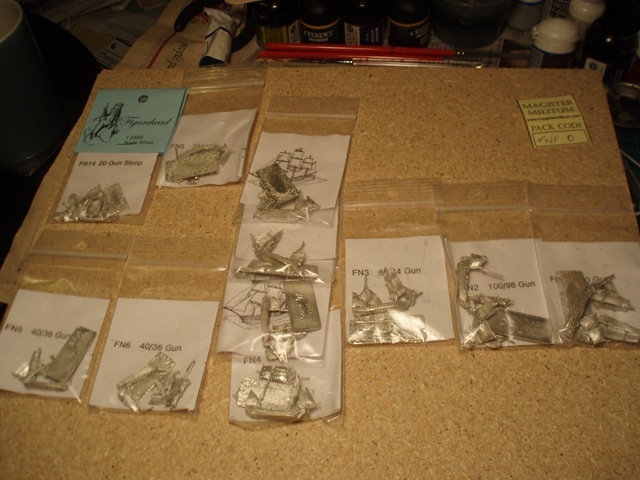 I ordered a starter pack of vessels from Magister Militum, and the contents are displayed in the photo to the left. When I got the starter pack, I looked through it and matched that to the vessels that Figurehead have in their Battle of Copenhagen pack. Those vessels, however, are moored and I wanted sailing so that I could use them in more general games. I also think that the Danes most certainly would have fought an opponent at sea, only being caught in port by the British fleet as they were trusting to their neutrality. I will post more about the Danish fleet later. This post is to look at the painting of the Figurehead 1/2400th vessels. They seemed the easiest to work with as there were few parts to be assembled, as you can see in the photo to the right. There are a number of manufacturers of 1/3000th and 1/2400th scale vessels, any of which I could have used. I will survey them later in a separate post. The vessels from Figurehead come in 4 parts. 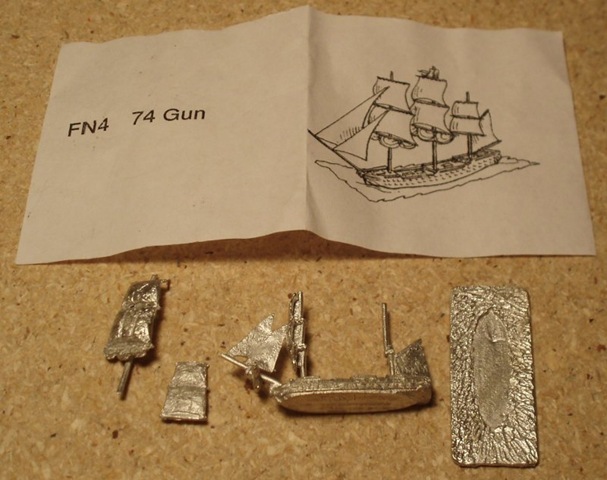 The packet contains a sheet describing the vessel (in this case, FN4 74 Gun) and a line drawing of what the model should look like once it is built. 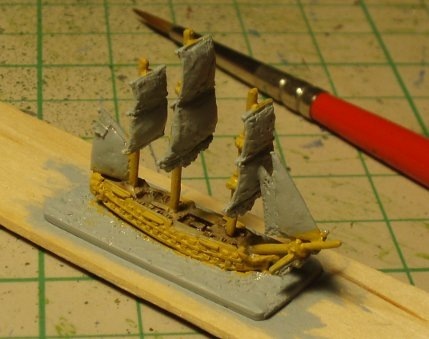 The parts are the hull with foremast, foresails, mizzen mast and spanker moulded as part of the model. Separate are the mizzen sails and the mainmast and mainsails. A sea base is the last piece. There was not much in the way of flash to clean up on the model so a light file and a little scraping with my X-Acto knife was all that was required. After spending 10 minutes with my partner’s nail polish remover de-supergluing my fingers, I gave up trying to use the basic superglue. I found an old tube of my superglue gel and used that for the rest of construction. It is better for this type of assembly anyway as it is tacky after about 60 seconds, with enough tack to hold the piece until the glue sets. The gel also allows for irregularities on the faces to be glued. By the way, the squares on the cutting mat in the picture are 1cm x 1cm. The model looks good when assembled, even though only in raw metal. One of the things I wanted to do with this model as well was to try using Citadel paints again. I’ve always preferred them although for historical modelling, Vallejo has a larger range. Citadel have reworked their washes and provided some foundation colours so I wanted to try them. For reference, I was using the Trafalgar Wargame Rules written by Mark Latham and published by Warhammer Historical Wargames. 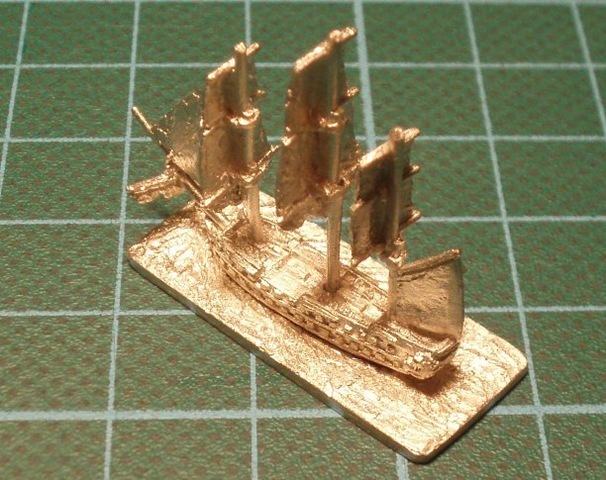 There is a good section in there on painting and rigging 1/1200th scale vessels. I had decided on 1/2400th so I could avoid having to rig. The painting guide, however, was very useful and I used it as the basis for painting this vessel. The first step was undercoating the ship. I did this using Citadel’s Astronomican Grey. Next time I will use white for the undercoat but the grey worked OK. The white would make the final painted vessel just a little bit brighter and in this scale, this is a good thing. The decks were painted using Citadel’s Bleached Bone. I like this colour and have used it before on World War 1 and Russian Japanese War vessels as a deck colour. Once the deck was painted, it was then washed in Devlan Mud. The wash was applied thickly partly to fill the lower areas on the deck. Once the wash had dried the 14 cannon on deck were very clear. Iyanden Darksun was then used to colour the sides, stern gallery and masts. The cross-spars were left as they will be coloured black later. I was going to use Bubonic Brown but decided to use the Iyanden Darksun which is slightly darker, then use the Bubonic Brown as a dry-brush over the top. Part 2 will cover the rest of the painting and show how the model went from the before to the after shots below. Can you send me some photos of the vessels you have had painted so far please? Email them to thomo at coldie dot net. I am afraid that I don’t know have a camera and would not know how to get pictures into my computer to e-mail them. Would it be okay for me to send you a sample of FN 2, FN 4, FN 6 and FN 15. I currently have 51 Hallmark 1:2400s and would like to increase the size of my fleet. Let me ponder Paul – I’ll come back to you later this week.